Who are we? …we are the daughters of our family’s passion for cycling. Moser blood runs through our veins and this has given us enormous experience in this sector, deliberately sought after and acquired in over twenty years of activity in this field. The running of the business is 100% female and therefore our sensitivity and passion has brought about our specialisation in all that cyclists wear, from head to toe! With this sensitivity and that touch of vanity which distinguishes our feminine nature, we carefully choose the most individual and functional garments from amongst the collections of the best makers of bike wear - both from the point of view of design and specific technical detail. 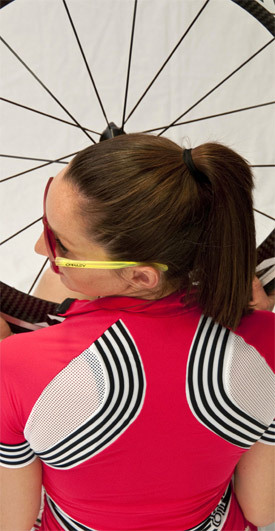 In this way we can advise and dress the more demanding men, but above all women, who love to cycle: we have created a line of cycling wear especially for them, ‘Re-cycling’, strictly made in Italy, with absolutely unique colours and models which we sell exclusively in our shop in Arco and on our on-line shop. Visit our on-line shop or come and see us, we will help you with your purchases putting all our experience and passion completely at your disposal.